With mid-season upon us, the stakes to the game were lifted with Heat 4 of the NSW Windsurfing Tour and the Formula NSW State Championship all wrapped up into one event. 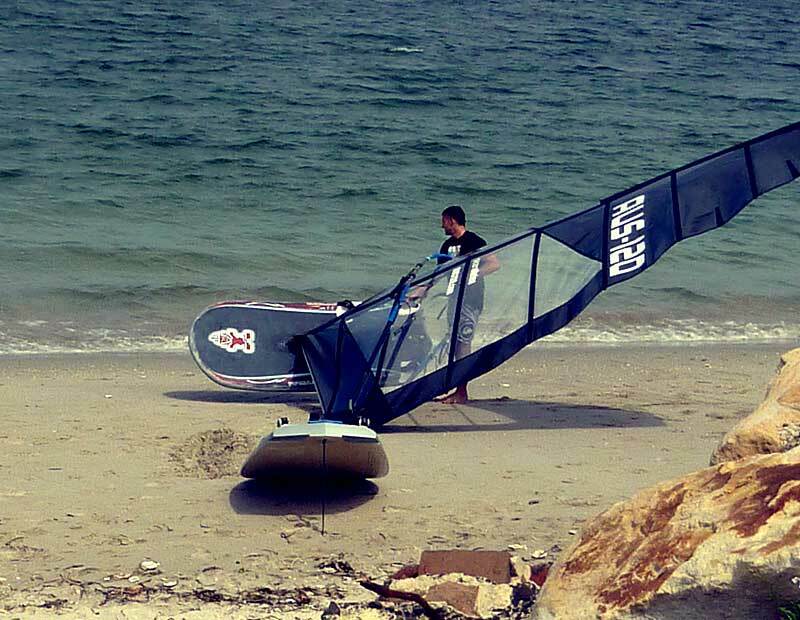 The titles attract the trophy hunters and in true Queensland spirit, Sean O’Brien AUS-120 arrived, fresh from the professional European season with a new Formula board and sails in tow, ready to rip our NSW title from our grasp. The weather was always going to be the biggest challenge of the weekend with 10knot NE forecast for Saturday and potentially nothing on Sunday. This put the Race Officer (RO) under immense pressure to race whenever the wind was at the championship limit (basically 8+ knots from a stationary boat). The wind filled in at about 3pm to the minimum and we were away for what was always going to be a tough session. Steve Floyd AUS-222 bolted on port to lead at the 1st mark on his 11m, only to be tracked down by Sean, with Sam Parker AUS-3 coming in 3rd. In the Free Formula (the old FE+) Barry Fawkes AUS-2111 continued his winning season beating David Flanagan AUS-057 who was sporting a brand new NP EvoIV 10m. Mick Saunders AUS-149 was 3rd. With the wind still hovering above the limit another race was set in motion. Brett Morris AUS-8 and Sean decided to take the port start option which resulted in a large lead at the 1st mark, which Sean expanded on to win easily. Brett on the other only received a box seat to watch the new and improved (12kgs lighter) Glen Morrell AUS-83, Mike Nelson AUS-12 and Steve Walsh AUS-55 mow him down on the final downwind for a 5th. Barry dominated the FF, but Roger Lucas AUS-303 proved his light wind potential with a 2nd. With 3 races required for a championship, little chance of racing on Sunday and the wind dying but swinging to the predicted NE, the RO decided to wait until the last possible minute to get in the decisive last race of the day. This proved to be a wise move with the wind swinging and filling in to the best conditions of the day. Sean made it 3 bullets on the hop (welcome back!!! ), with Mike and Steve Floyd having strong finishes for the minor places. Barry Fawkes had the same result in the FF with 3 bullets, but 2nd place when to David Howe AUS-688 who is now consistently in the top 5. Mick Saunders produced his third 3rd for the day. With a 7pm finish there was no socializing (that I know of? ), just home to a meal and well earned sleep. 30+ degrees, and a nicely developing easterly breeze surprised us all, and the course was set for more racing until….the sky turned black and the lightening began. Racing was cancelled for safety reasons as the storm was predicted, with no wind to follow, which is exactly what happened. Congratulations to QLD’s Sean O’Brien on getting bragging rights on NSW for another year and also to Barry Fawkes on winning the FF division, which is growing in participation at every event. Thanks to Nick Nelson our RO, who produced the best possible result from an almost impossible forecast? I’d like to say something nice about the GM winner. Give me a minute, I’ll think of something. I do not believe for a minute the suggestion that Bushfire received favourable treatment from race officials known to be his close associates. I am certain he did not pay bribes to fix the results or have racing cancelled on Sunday when he was leading. The fact that a few months ago he was a decrepit, barely mobile shattered hulk whinging about some trivial bone snapped in his leg, unable even to do half decently in FE+ and that he improved so dramatically compared to prior results this season does not suggest to me that a swab should be taken as it would in any other sport. I do not support the view that Ben ought get the praise for his advice & loan of his gear, even though he was obviously the brain behind the success. I believe he did go round the top mark & did do 2 laps, despite what others may say, the video was clearly faked. In short I defend Bushfire’s integrity and sailing prowess and congratulate him on a fine victory. Don’t believe any contrary stories you may hear, they are quite possibly mostly incorrect. Reading between the lines, it is time to install random drug testing…. I think this is a case of mixing up Uncle Bruce’s wise windsurfing advice he always offers me before a race – “move your mast base all the way forward” and “your boom height should be at shoulder level,.. when you are on your knees” etc etc (all good advice I should add). I was so frazzled after pleading with Ben to loan me his gear on Saturday that I clearly got Uncle Bruce’s advice mixed up – sorry! I did note the it seemed like you took your own advice though Uncle Bruce. I won’t ‘t let this abberant result stop me taking Uncle Bruce’s wise words……..
Just make sure it never happens again. I don’t care personally. It is just Ricardo & Tibor are so accustomed to plotting to beat each other that it quite puts them off their weet bix when their world is turned upside down. They are used to hating each other, now they have to learn to hate you. Shouldn’t be too hard but then I have more experience in that department.